The primary goal of this conference was to establish a basis for the reflections undertaken by the newly-restructured IDEA on the subject of the theory and practice of interdisciplinarity in English studies in France. The opening presentation of the conference described some of the broad questions that members of IDEA had begun to address in order to come to terms with the question of interdisciplinarity. The importance of a clear distinction between interdisciplinary, pluridisciplinary and transdisciplinary approaches was stressed, and the difficulties involved in transferring methods from one discipline to another were outlined. The success of the conference was due in large part to the care that participants took in defining the limits of given disciplinary fields, ‘limits’ that do not really exist in the strict sense of the term, since one field is enriched by its contact with other, related fields, even if each retains a distinct identity. The conference also explored the need to establish a (sometimes contentious) dialogue between the logic of divergent disciplines (as, for example, in the fields of literary criticism, enunciative linguistics and the history of ideas) and the types of imperatives (intellectual, ethical and institutional) that continually force us to question and redefine disciplinary boundaries. Some presentations drew attention to the nomadic nature of interdisciplinary work: one leaves one’s own disciplinary territory in order to venture onto that of other scholars and then to return, via a movement of deterritorialisation/reterritorialisation. In the process, one runs the risk of putting oneself in danger by ‘poaching’ (Alain Roger) on the lands of a related discipline, and one must be continually conscious of the danger of falling into simple amateurism. The fields that are questioned and re-evaluated by an interdisciplinary approach are thus not stable, as witnessed by the cases of ‘cultural studies’, ‘postcolonial studies’ or ‘gender studies’. Such subjects, by drawing upon a wide range of theoretical approaches, manage to define their own objects of study, fields of application and concepts. 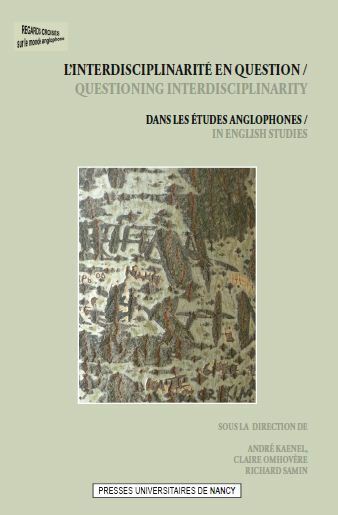 A collection of articles based on the presentations given at the conference was published by the Presses Universitaires de Nancy: L’Interdisciplinarité en Question / Questioning Interdisciplinarity (2009).